LERWICK’s South Commercial Street will reopen again on Friday lunchtime after the seawall supporting the street had been damaged during a storm in the middle of December. 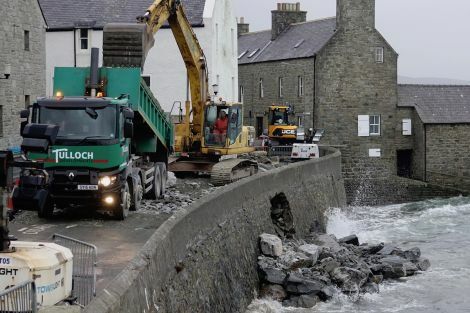 Shetland Islands Council said on Thursday that the road would initially only be open with a reduced width and fencing to the seaward side. This will have some effect on the availability of parking in the area, the council said. These arrangements will stay in place until better weather allows for more permanent repairs. Shetland Fishermen’s Association (SFA) has begun distributing safety equipment to its members in the inshore fleet. It follows the award of a European Maritime Fisheries Fund (EMFF) grant of £12,750 towards the purchase of liferafts, lifejackets, EPIRBs (emergency position indicating radio beacons) and PLBs (personal locator beacons). 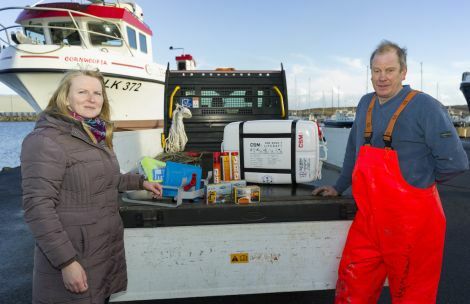 SFA policy officer Sheila Keith said: “The SFA takes the safety of its members very seriously, and while fishermen in the whitefish and pelagic sectors have this sort of equipment, it is less prevalent among those operating small boats less than 10m in length. Mary Macgregor of BAKKA with her silver award. WESTSIDE based knitwear company BAKKA has won a silver award for best product at Scotland’s Trade Fair clothing and textiles section. The criteria used for judging the products are overall quality, packaging, wholesale and retail pricing and general sellability. Mary Macgregor, the designer and founder of the Fair Isle textile company. said she was delighted. 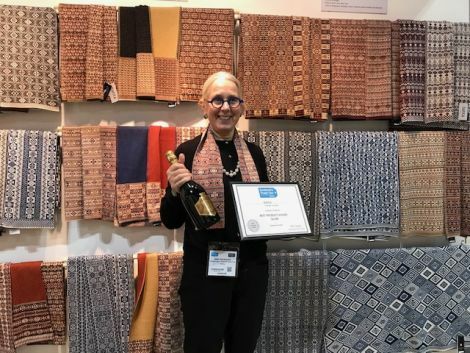 While on the mainland, BAKKA also attended the UK Trade Fair and Top Drawer London to present her new collection. SHETLAND Distillery Company has been shortlisted in both the family business of the year and the scale-up business of the year in the Federation of Small Businesses Awards 2019. The awards lunch will take place on 21 February in Edinburgh University’s Playfair Library. Five businesses from the Highlands and Islands have been shortlisted across five categories in the Scotland wide event. The FSB’s new Highlands & Islands leader Tanja Lister said: “The entries for this year’s FSB Awards have been exceptional and I know that shortlisting was very far from easy.